Buildup of sand and soil can clog the pipes in french drains. Building a wider drain will make it last longer before getting clogged up. 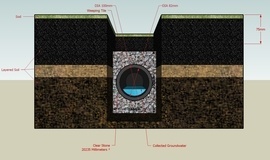 The cost of a French drain depends on how deep and how long it is. A shallow, exterior French drain costs about $10 to $15 per linear foot, whereas a deeper, interior drain costs an average of $50 to $60.